Marian cult developed significantly within the whole territory of Slovakia in the 18th century. Pilgrims were mainly visiting miraculous statues at which they prayed for health. 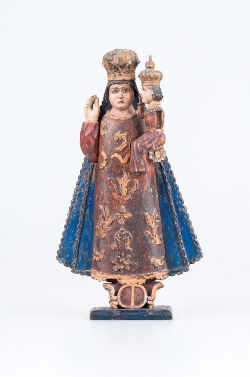 Pilgrims were offered to buy small or larger memorial items at their pilgrimages such as folk polychromatic statues depicting a patron saint of a respective Marian church. There were some very popular pilgrimage locations in Slovakia, one of them Dubnica nad Váhom where in the Saint Jacob church the early-Baroque statue of Virgin Mary with child located at the main altar has been venerated. Residents of Dubnica built a new church in 1742 as the old church had not been big enough to take in all the pilgrims who were coming to the place every year. Mikuláš Iléšházy transported the miraculous statue into the new church from the Trenčín castle. The archive of the Roman Catholic parish office in the town of Dubnica stores dozens stories people told about how Virgin Mary from Dubnica had helped them to recover from many diseases. They asked for help Madonna and child standing on a crescent moon with earth in her left hand as a symbol of future Christ´s dominion over the world. Child softly touches mother´s cheek with right hand. It is the detail that distinguishes this type of Madonna in Dubnica from other depictions of Virgin Mary at our territory. The figures are surrounded by the aureole consisting twelve stars. Bearing in mind artistic quality of the sculpture, it must have been a professional sculpturer of the Eastern Europe origin who made the statue. Pilgrimage statues were reproduced by folk artists in the form of pictures of saints and sold among ordinary people in the 18th and 19th century. A folk woodcarving reproduction of the statue of Madonna of Dubnica, now archived in the museum of the ÚĽUV, refers to the steel-plate engraving presentation of Madonna as published by Jordánszky (in 1838). The woodcarving respects basic scheme of the original and presents details of three-dimensional artefact in a unique way. It is supposed to be one of few illustrations of folk reproductions of this type of pilgrimage statues. If compared with the original and the lithograph, the folk carver made some minor changes to the hand of child. Mother´s body is depicted differently than original and she wears bell-shaped two-part blue cloak with decorations around hems. Unfortunately, the statue is, to some extent, a torso – Madonna´s right hand has been replaced by a new one and child´s forearm is missing. However, the overall impression has not been damaged.